Dramatic, smooth, powerful and effortless. 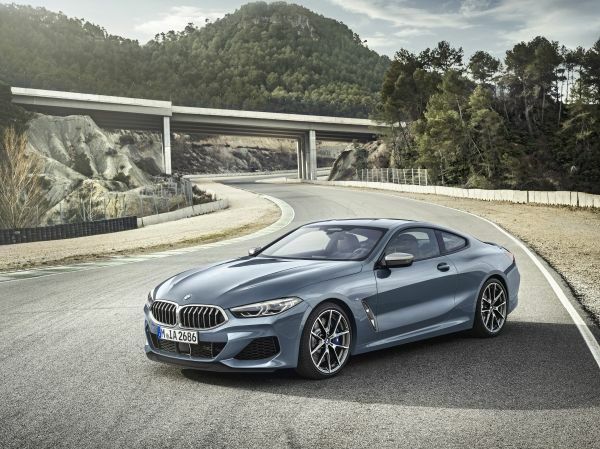 These are just some of the words that begin to describe the all new, 2019 BMW M850i. This is BMW’s modern interpretation of a luxury Grand Tourer and they have done a great job with it in almost every aspect. (Full disclosure, I currently have a neo-classic BMW M car in my collection). 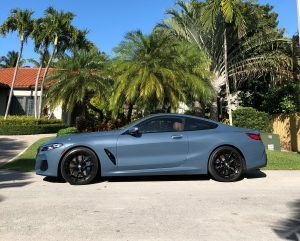 The color is gorgeous and trendy, BMW calls it Barcelona Blue Metallic and surprisingly, it’s standard on the color palate. The classic BMW kidney grill is big and wide, but still fits the design of the 8 Series perfectly. Additionally, there are a number of air inlets, aerodynamic shapes and forms that create a modern, muscular design throughout the car. On the side of the front fenders, there is a swooping ventilation duct, giving the side profile, nice character. The roof is made from dramatic M-Carbon which gives is an air of sportiness. At the rear, the trunk design is exaggerated with a forward angle, topped with a subtle spoiler that is both functional and good looking. The twin, corner exhausts are chiseled into an oblong trapezoid shape that makes a design statement in an area of the car that is often overlooked by most designers. Bravo BMW! Once inside, you are greeted by an expanse of sumptuous leather, covering almost every area, from the dash, doors and of course, the seats. Speaking of seats, I felt these seats had more comfort than previous large BMW coupe, the 6 Series. Rear seat is still quite cramped, suitable mainly for short drives and short people or kids. Frankly, on the all-new 8 Series the interior is not about the seats or the leather, it’s about the all new instrument dash architecture and the spectacular “Glass Controls” which are the diamond cut glass-like gear selector, radio knob and iDrive control. This is a must-have option as it gives the M850i a distinct modern and elegant feel without being over the top. Overall the interior feels more luxurious and more cohesive than other BMW’s. Infotainment screen is thankfully, looking less like an afterthought and more of an integrated item on the dash. Controls and switchgear all feel 1st class and very BMW-like! One interesting change on the dash is the departure of the ubiquitous headlights knob. BMW is now bidding goodbye to this 20th century relic, replaced by a discrete push button switch instead. When I noticed that, it certainly brought back a nostalgic feeling realizing that the light switch is not really needed any longer, as lights are now considered an automatic function. (Except for some Miami drivers I see driving without their lights in total darkness, but that’s another story.) Trunk is surprisingly wide and deep, albeit with a narrow opening. There are various selections the driver can make regarding the driving style. There is Sports, Sports Plus, Sports Individual, Adaptive, Eco etc. I tended to select Sports the most often, as this made the M850i become more alive and wound up. 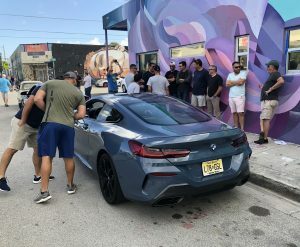 The hat trick for my weekly cars and coffee held Sunday mornings in the uber-chic area of Miami called Wynwood, was to select the Sports Plus setting and rev the engine a few times, the exhaust would reward all the passersby with a cool sounding braap, braap sound, followed by a nice crackle. Certainly, was fun! Using the glass-like gear selector is easy and intuitive, offering both standard auto or a flick of the wrist, places it into manual mode. The M850i is a big car yet it doesn’t really drive like one. Steering response from the electric steering is quick but not overly so. Power comes on silky smooth and feels almost limitless. This is a quick GT, with a zero to 60 time of 3.6 seconds and electronically limited to 155 MPH. Suspension is also very GT-like, which means you can drive this coupe for hours and not feel fatigued. Brakes are linear, quiet and easy to modulate, even under hard braking. Overall, a superb package for sure. I’m not sure why, but I did have a few gremlins during my week with the M850i: After a few days, a message that PDC “Park Distance Control” failed started appearing, then it went away. 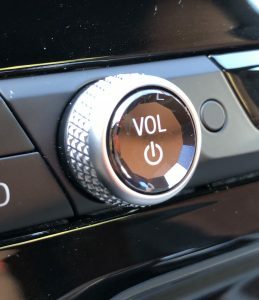 Then the LDW “Lane Departure Warning” system would not stay in the off position and finally, the iDrive knob and associated buttons around the iDrive stopped working entirely. Maybe the system needed rebooting. I did call my friendly BMW service advisor and he said bring it over and within an hour, he would scan it and have it up and running. Regardless, it didn’t interfere with my driving and impressions of this sumptuous GT. Would I own this if I was in the market for a luxury coupe? The answer is without a doubt, yes! It’s comfortable, sporty, elegant and east to live with. This is truly a luxurious personal coupe that will swallow the miles with ease, comfort and elegance. 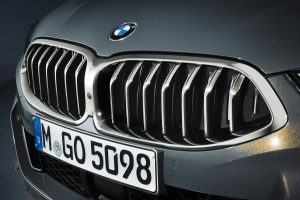 Welcome back BMW, we missed you!